Dinneen gives a longer, more poetic name for this mountain: Muisire na Móna Móire, 'Muisire of the great bog'. Móin Mhór was the old name for a chain of hills including the Boggeragh Mountains and Nagles Mountains. The element muisire does not appear elsewhere in Irish place-names. Judging by the late 16th century forms from maps, e.g. Knock Muskery, it appears to be connected with the Múscraige, who gave their name to the barony of Muskerry. It is on the NE edge of the ancient territory of this people. Mushera has two holy wells: one at the summit for sick animals and one on its northern slopes [St. John's Well] for humans, at which mass is celebrated at midsumer (Daphne Pochin Mould, 'Discovering Cork', p.22). Musheramore is the highest mountain in the Boggeragh Mountains area and the 209th highest in Ireland. 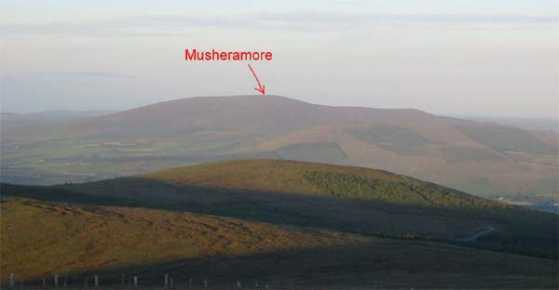 Musheramore is the second most westerly summit in the Boggeragh Mountains area.